Click here to read part one: Early Planning! Welcome to the second installment of my VietBodia2015 series! I have completely failed at my "post every four days" plan, and I actually wrote this post the same day as the first one (which just makes it worse). Sorry! I'll hopefully get the others out before my leave date... but I won't make any promises. This second post will focus on hostels. As I am a very cheap person, I love hostels. And traveling anywhere in the Mekong/Indochina region will give you plenty of cheap places to stay. The dollar is very strong there, and both Vietnam and Cambodia accept the currency. Vietnam also uses their national currency, the dong, but Cambodia uses dollars almost exclusively. 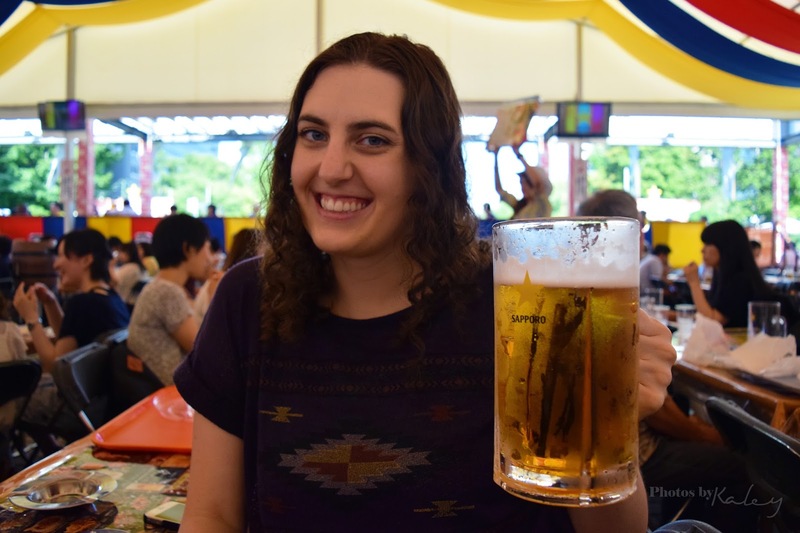 I’ve gone on a number of trips around Japan and have stayed at great hostels along the way. Granted, the hostels in Japan will likely be quite a bit different from those in Vietnam and Cambodia, but I imagine the experience to be similar. I really, really enjoy staying in hostels for a number of reasons. One of the most enjoyable parts of staying in a hostel in a foreign country is that you can meet other people like you and take a break from the “foreignness” of the place you’re in. If you’re traveling alone you can meet a travel partner, or if you want suggestions of places to go you can likely find someone to give you suggestions. They have common areas with computers and televisions and even kitchens where you can socialize, and it appears that many of the hostels in Vietnam and Cambodia double as bars, making the walk home at the end of the night that much better (and safer)! Since I’ve mentioned bars, I think it is important to note that hostels are usually not very quiet places. You can find more basic hostels that aren’t as social and focused more on just providing a place to sleep, but I personally would put up with the noise to meet awesome people I couldn’t meet anywhere else. I’ve met people from all over the world and it’s always great to stay up late talking to people and sharing your culture and learning about theirs. Finding a hostel is very easy, I was actually shocked at just how easy it was when I first started staying at them. There are a number of websites you can use to find hostels. http://hostels.com/ and http://hostelworld.com/ are the two that I most often use. I highly recommend looking at multiple websites before deciding your hostel. For this trip I used Hostel World mainly, for no particular reason other than I have used Hostels.com in the past and wanted to check out Hostel World. But I double checked all of my choices on Hostels.com before deciding! 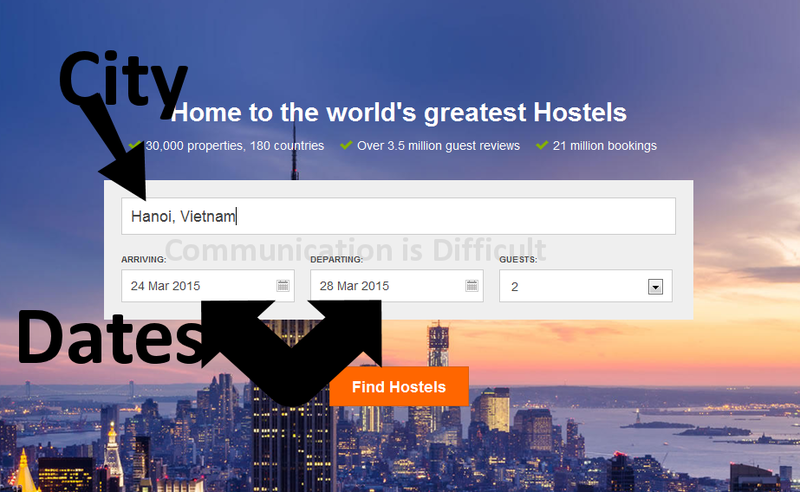 Using these websites are super easy, when using hostelworld.com you see the main page asks for a city and a length of stay. I’d enter “Hanoi” and click on the city when it pops up in the drop down menu, then change the dates to “March 24” and “March 28” since those are the days I’ll be there, and leave the guests at 2. Right away you get loads of results. These can be daunting. It’s automatically sorted by availability, which I think is useless. I usually begin by sorting by rating and seeing the prices for the highest rated options. The top hostels range between \1000-\1500, but I switched it to US dollars because that’s what I’ll be using there, and that changes to $8-$12. How cheap! Now, since it is so cheap I could probably stay anywhere I wanted to, but chances are these highly rated hostels don’t have a lot of reviews. I would rather stay at a place rated 90% with 500 reviews than 100% with 10. Now that I know the price range, I like to fiddle with the settings on the left hand side, hostels.com also has a nearly identical setup. The sliders for price and rating are what I focus on, as they are the most helpful. For this trip I moved the price down to $10 max and the rating to 83%. Then I sort it by price and see the cheapest options with this limits. There are a lot of acceptable hostels at $5 a night, so that is what I set my budget to reflect. 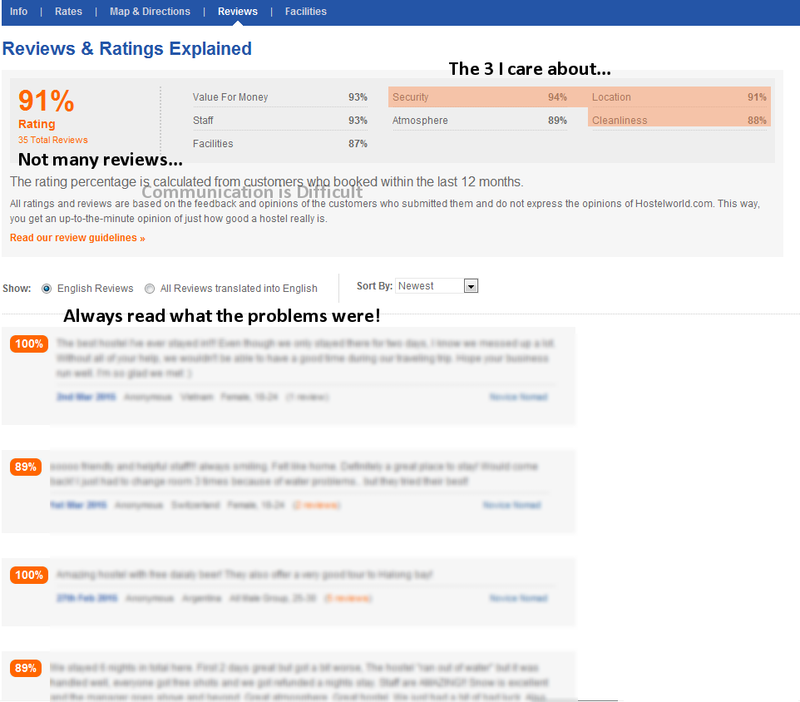 After finding a hostel that looks good with a good number of reviews and a good rating, I look at the page itself. The pictures are the first thing I look at. How does the common area look? What is the design of the bedrooms? How about the bathrooms? These pictures alone will knock out a good number of options. Then I read the descriptions, which are usually written by the staff. If they sound nice and friendly, it makes me like them. Then, I see what kind of rooms they have available. You usually get a few types of rooms at hostels, and you have to be careful when picking one. There are “mixed” and/or “private” rooms at every hostel. The former is shared with many people, while the latter is just you. I have decided on mixed rooms for my trip, as it’s super easy to make friends that way. Though you have to deal with people coming and going at all hours, but that hasn’t really been a huge issue in that past. Though it is sometimes jarring to wake up to a shirtless man hunched over his bag at 2am, I honestly feel there is little danger in the situation, since nearly all hostels are guarded by security (don’t stay if they aren’t) and you will know who is in your room. Anyone who is stupid enough to try something in a hostel probably won’t be that big of a threat. And if you’re staying with someone else you’ll never be alone. Private rooms are good, I’ve not often stayed in one, as they are more pricy and I would rather spend the money on other things, but be careful when booking. If you book a four bed private for $10 per person, you will have to pay $40 for that room regardless if you have 2 or 3 people, and you cannot put five people in a four bed private room. Also, if you’re getting a two person room, be sure that if you get a 2 person double you don’t mind sharing a double bed! If you want a separate bed you’re stuck looking for a 2 person twin, which can be difficult to find and another reason I opted for the mixed dorms! After I see that the price and type of room is okay, I move onto the reviews. I read the really good reviews first to see what positives the hostel has. After that I read a view of the not-so-good reviews, usually those who gave it 60-70% and see what their issues are. If there are a lot of the same complaints, it’s likely a large issue. Always read with an objective eye and know that sometimes hostels are having a bad week, or maybe that person is just hard to please. Often people go into hostels with unrealistic expectations, like complaining that the bar way noisy. Of course it was! You stayed at a place with a bar. It comes with the territory. And honestly at $5 a night as long as the toilet flushes and the shower runs I can accept almost anything! The best part about using websites like these are that they have a handy “Facilities” section near the bottom of the main page which gives you a quick list of things the hostel offers. Must haves for me are 24 hour security, air conditioning, free WiFi or internet access, hot showers, lockers, and linen included. There are others that are bonuses, but if the place doesn’t have all of these I likely won’t stay there at all. In my experience the vast majority do. Booking the hostel is really easy! All you have to do is just select how many people you want for the room and enter your information. Making an account speeds up the process. You’ll have to do a downpayment on the booking, which is usually 15% of the total cost, at the time of making the reservation. But the rest will be available upon arrival. For an extra couple bucks you can even gain the ability to change your reservation and get that downpayment back! Once you’ve booked your hostel you’re set. The hostel should email you within a couple of days to verify your reservation, and at that point you can ask them any other questions you have. Can they arrange pick up at an airport (there’s an option for that in the “Facilities” section so look for that if you want it! ), can they help you arrange tours to different sites, is there anything they recommend doing in the city, those type of things. The best thing to remember about hostels is, you're only using them to sleep. When you're traveling around you won't be spending much time inside it's walls, only to socialize in the common rooms or grab a few hours of rest before you're off on another early morning adventure. And it's temporary. If you can remind yourself of these things, you will likely really enjoy staying in a hostel. Sure, there are awful ones that have gross old sheets and disgusting showers and broken toilets, but the majority won't!